My husband is under the weather today, so I put some ingredients in the crock pot to make a nice soup for when he gets home. Man, those onions and other aromatics have started to warm up and the house smells SO GOOD. It’s reminding me of when my mom would start up a pot roast or red beans and rice or something in the crock pot. They have come a long way (different sizes, spillproof lids, stainless steel, etc.) since then but they are still so great. Just put some ingredients in a pot in the morning and come back to a meal. Yum! 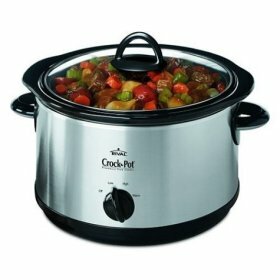 CROCKPOTS RULE THE WORLD!!!!!!!!!!!!!!!!!!!!!!!!!!!!!!! Can you give me a recipe for red beans and rice in the crockpot? I’ll call Mom to confirm and then I’ll email it to you. I think I got it, but I want to make sure I haven’t left anything out.